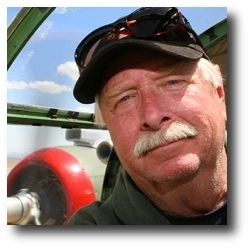 Larry is an award winning professional aviation photographer and graphic designer with over forty years of experience. 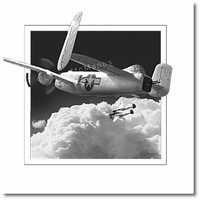 His aviation prints have been published and sold around the world. Larry is currently represented by photo houses and galleries in New York, Spain, England, Colorado and California. While shooting aircraft over the years, he came to the realization that shooting air to air and getting the right angle, background and detail consistently was expensive, time consuming and impossible. So calling on his skills as a designer, he created a photo illustration technique that allows him to design and create beautiful large format detailed aircraft images just the way he envisions them. The Concept...First Larry sketches out what he wants the final image to look like and then creates a shot list for the various parts of the image. Using this sketch guide he shoots the various parts of the image. No computer generated images are used. All photography used in each image is shot by Larry. The Creation...There are no short cuts in creating the final large format photo illustration. Larry starts by editing the shots down to the ones that will be used in the final master image ( that is usually around 6 to 10). This is where his background as a designer/artist comes in. The final 2 GB master image can take forty hours or more of painstakingly detailed work to combine all the photos, re-illustrate parts of the plane and scene, add reflections, take out landing gear, mask the plane and seamlessly integrate the plane into the background. The final stage is to color correct and balance the contrast in the final image. No computer generated images are used. His aviation images are all photography and are shot by Larry. Larry’s four foot wide "High Definition" prints were created to be reproduced at this width. This is the reason for the excellent detail, sharpness and color saturation that you see in every print. These are the most detailed aviation prints at this size you can find. My large "Mural" prints are not printed using any inks. To reproduce the fantastic detail and saturated color, these aviation images are printed using actual red, green and blue lasers that can produce 68 billion colors. The lasers project the image on actual photographic material and then is processed through chemical baths. This gives you a TRUE HIGH DEFFINITON (HD) CONTINUOUS TONE IMAGE with no visible dots like you see in offset lithography printing. This printing method is far superior in detail and color depth than any other reproduction method. "F-4 Phantom (US Air Force)"